Our complete limber chest, including handles and brass top. We offer limber chests from the basic wood box to a completely finished limber. This Birch wooden chest is correct dimensionally, made from 1″ thick Birch panels, not dovetailed. 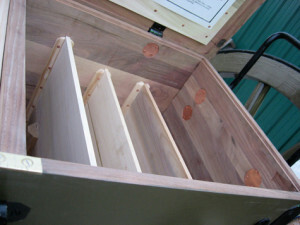 The sides, bottom, front and back are glued and secured with 2″ flat head wood screws. The corner plates cover the screws. Includes all wooden parts. This chest appears exactly like the more expensive model on the outside. You cannot tell it is not dovetailed on the inside either. The only real difference is you do not get the cherry or walnut look on the inside, but you save $700 for the difference. This Walnut wooden chest is correct in detail. The sides are dovetailed as per period specifications, made from Walnut. The bottom is made from Oak. All slots for side and front plates are routed out. All grooves for hinges, stays etc grooved. The box is finish sanded. Very beautifully done! Made by a local furniture maker. 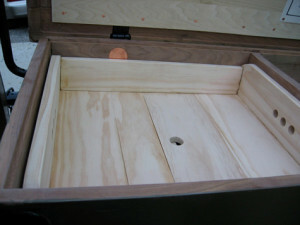 The Cherry Limber Chest is exactly like our Walnut chests, they are correct in detail. The sides, front, and back are cherry. The bottom and principle divider are white oak.